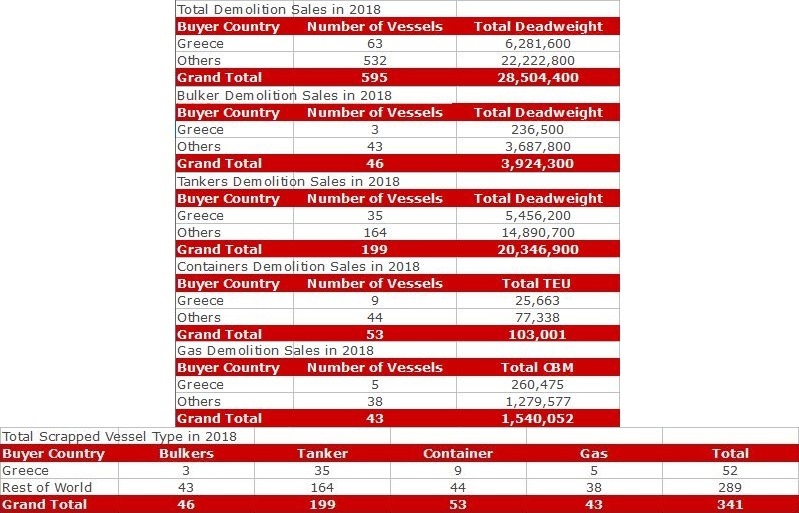 Ship owners from Greece poured 4.6 billion dollars for the acquisition of second hand vessels during 2018, as per VesselsValue data provided exclusively for Hellenic Shipping News Worldwide (www.hellenicshippingnews.com). In total, Greeks bought 305 ships, with a dwt capacity of 28.22 million tons, far more than any other single country. As always, larger ship types were the preferred “weapon of choice”, with the 28.22 million tons being almost double the size of other countries. 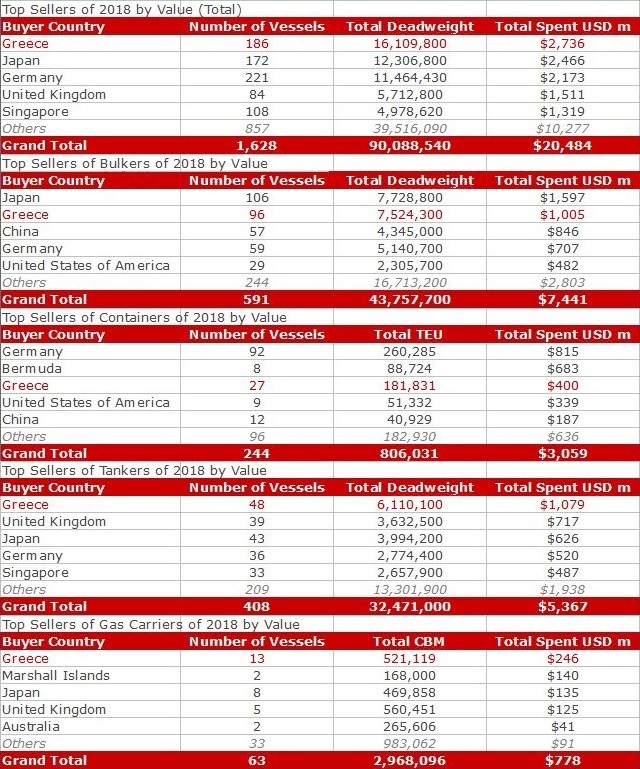 Globally, as per VV data, a total of 1,628 ships, 90 million-dwt were bought and sold, representing a market value of almost 20.5 billion dollars. After Greece, in second place came Norway who invested $2.76 billion. This amounted to 113 vessels with a 5.3 million-dwt. Chinese owners came third (by market value), investing $2.5 billion for the acquisition of 247 ships of a deadweight of 15.4 million tons. Hellenic owners starred in the various subsegments as well. They were the biggest buyers of bulkers, tankers and LNG/LPGs as well. 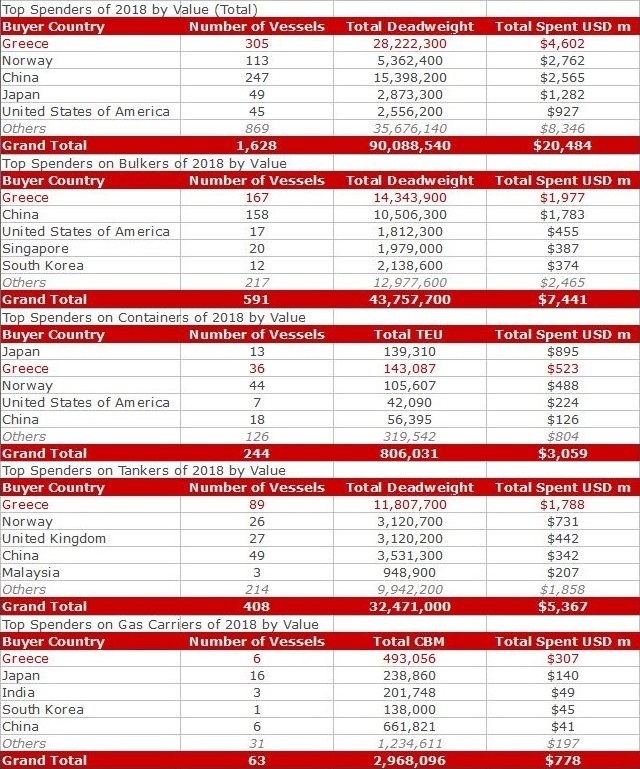 More specifically, they placed almost $2 billion, or about 40% of their total investment, in the dry bulk segment, acquiring 167 bulkers with a deadweight tonnage of 14.34 million tons. 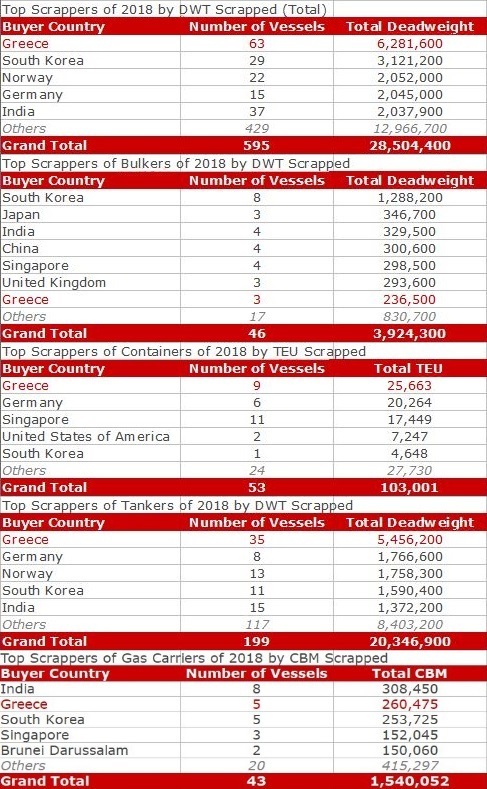 Chinese dry bulk owners came in second place, with acquisitions of 158 ships, 10.5 million tons-dwt and an aggreggate investment value of $1.78 billion. 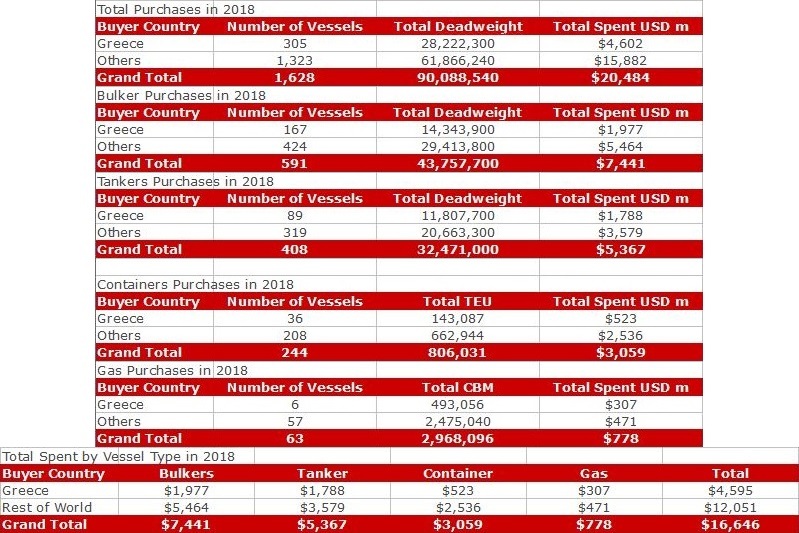 In tankers, Greek ship owners acquired 89 ships, adding 11.8 million of deadweight tonnage for a total amount of $1.78 billion. Based on tonnage, Greeks added about one-third of the total S&P trade activity last year, which amounted to 32.47 million dwt. It’s more than obvious that local owners sought to take advantage of low asset values, on the back of a free-fall freight rate environment for a good part of 2018. If that bet pays off, remains to be seen in the coming months and years. Based on the value of tankers bought, Norwegian owners came second with investments of $731 million and 26 ships acquired. On the other hand, Chinese shipping interests bought 49 ships, worth just $342 million, an indication that they opted for older and smaller units. Meanwhile, Greek owners were rather active in the up and coming LNG/LPG segment, once a niche market, but no more. 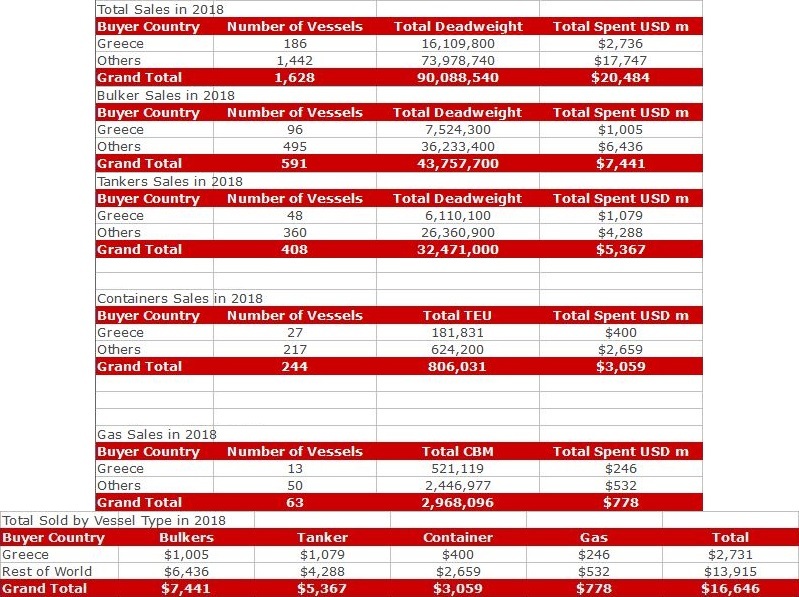 According to VV data, during the course of 2018, Greek shipping companies acquired six ships through the S&P market. However, these ships were bought for a total of $307 million. They have a capacity of 493,056 cubic meters.